Why do I get ads in software I’ve paid for? 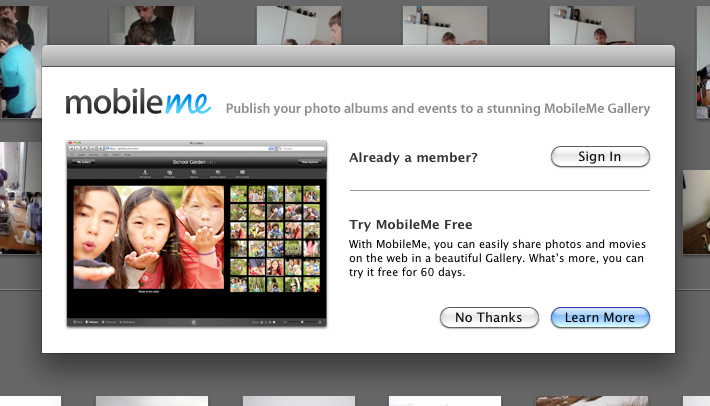 An immensely annoying feature of iLife 09 and specifically iPhoto 09 is that it you don’t subscribe to MobileMe you get pop up adds for it as shown below. Why oh why oh why? This is driving me around the bend slightly. If I wanted to use MobileMe I would have subscribed long ago.. endless alert boxes asking me to is not going to encourage me.